One of the great benefits of working in the DSK shop is that if a kayak tour isn’t full, we (the shop staff) may be able to tag along. That is great fun for us, of course, but also has the benefit of helping us be able to better help our customers, by giving us first-hand knowledge about our trips. Last evening, I was able to go on my first Sunset Trip, and wow, what a beautiful experience! It was a warm, sunny evening, and we launched from the west side of the island a little before 7:00. We headed south along the shoreline, toward Lime Kiln State Park. The Olympics were in front of us, stately and beautiful. The first wildlife delight was hundreds and hundreds of little bait fish, jumping out of the water. It looked like fish popcorn! Then a bald eagle flew by, right along the shoreline and up into a huge nest. Later, a few harbor porpoises made a brief appearance, bobbing by. On the way back, we saw the bald eagle again, but this time it brought dinner to the fledglings in the nest. I couldn’t see the young ones, but I heard them making their eagle-talk screeches. The paddling was peaceful, and the water smooth. I loved being out at that time of day and seeing the light and the colors change. 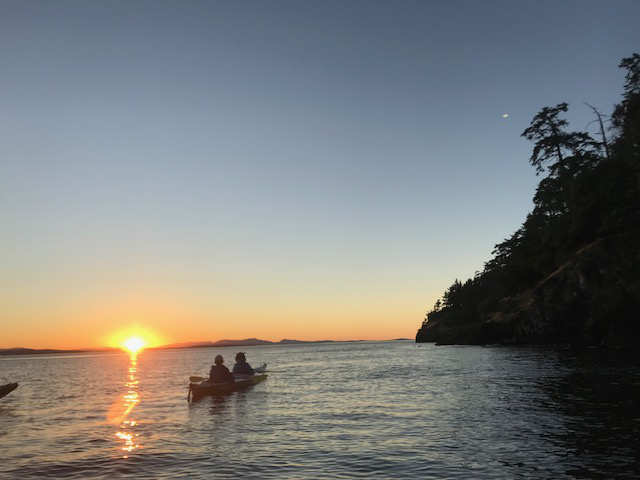 As we turned around a little south of the lighthouse, and starting paddling back north, we were able to watch the setting sun in front of us, getting lower and redder every minute. Completely beautiful.